Crazy end of the year busyness means I’m just now ready to share about my time in Albuquerque. I attended a press event in the fall, and captured some great photos from my time there. The city has a lot to offer for visitors! Here are my picks for things to do in Albuquerque, New Mexico. To get a real feel for the nature of Albuquerque I highly recommend booking a desert jeep tour. We went out with New Mexico Jeep Tours and had an amazing adventure filled with squeals and laughs. Our driver took us on a bumpy and beautiful outing to the Ball Preserve.We visited the ruins site of a historic pueblo house. One of the most amazing experiences was coming across a large herd of wild horses while on our jeep tour. TIPS: Ask your driver to take the tops off of the jeeps so you can stand up and get a rooftop view from your adventure. Just be prepared for lots of bumping and you might end up with a few bruises from bumping around on the bars. If you’re looking for unique things to do in Albuquerque, this was a brand new experience for me! If you’ve ever seen the powerful Spanish dancing style of Flamenco on TV or movies, here’s your chance to see it in person. Plan a visit to Tablao Flamenco Albuquerque at Hotel Albuquerque at Old Town, for a unique cultural experience. You’ll see some talented dancers and musicians perform this mesmerizing dance performance. It’s not just the dancers though who will draw your eye. Watch as the other dancers and supporting musicians tune into the dancer’s rhythm to support her or him with their clapping and music. Extremely enjoyable and educational experience. TIPS: Families, consider the Sunday performance times since it’s earlier in the day (6 pm vs 8 pm). There are a few seating options for the show. I highly recommend buying in advance to get standard or premium seating versus general admission which is patio seating or bar standing room. One of my surprising finds was the Petroglyph National Monument. This amazing monument protects one of the largest petroglyph sites in North America. Wander around volcanic rocks that feature designs and symbols carved by Native Americans and Spanish settlers 400 to 700 years ago. TIPS: Stop at the visitor center first, but don’t expect to see petroglyphs there. Park staff at the visitor center can help direct you to trail options based on your timeframe and the degree of difficulty of the trail. And don’t be fooled by the moniker “monument”. This is really an extensive park that can take 30 minutes to 4 hours to travel around. The average visit is 1-2 hours, but allow more time if you want to really enjoy some hiking. Families can visit the Boca Negra Canyon in about an hour and see quite a few petroglyphs. One of the must do things to do in Albuquerque is a hot air balloon ride. The city is famous for their annual hot air balloon festival. We started our morning off early with World Balloon and floated up, up, and away. Thankfully we came back down eventually, but not before getting a gorgeous aerial view of the landscape surrounding Alburquerque. TIPS: Since you do start early in the morning, don’t forget to pack some warmer layers to help you survive the chilly start. Thankfully once you’re airborne and the sun is fully out the weather will be warmer even up high, which is why you want layers. The Valles Caldera just recently joined the National Parks Service in 2015. Much of the Valles Caldera is now protected and part of the Valles Caldera National Preserve. The area is full of historical events, many of which revolve around the area’s rich obsidian deposits. Inside the caldera are several grass valleys, the largest of which is Valle Grande. This is accessible by paved road and is where we spent a bit of hiking time on my trip. A new NPS ranger station is on site as well, to help with education and to get passes. TIPS: There are a limited number of driving day passes that give you access to the interior of the preserve. If you’re planning to hike or explore for awhile, arrive early so you don’t miss out on obtaining a vehicle pass. Also note, that while this is on my list of things to do in Albuquerque, it is about a 2 hour drive from Albuquerque to Valles Caldera. Before my visit to Albuquerque, I imagined the city as a desert landscape. Little did I know that there are mountains in the region, even ski runs! 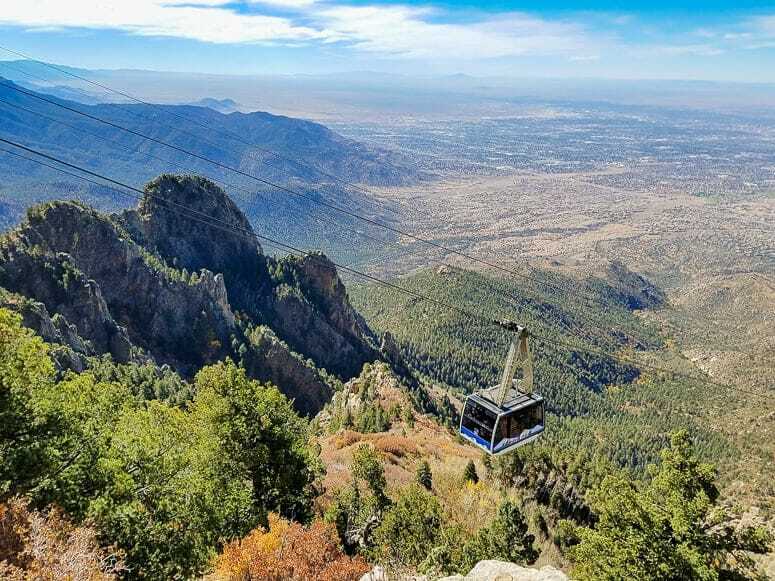 The Sandia Peak Tramway is a fun experience that also will give you some great views. On the ride up, which covers the distance of 2.7 miles, you’ll be amazed at the massive canyons and boulders you coast over. Once up top you can do some hiking, or just take in the view and get some great pictures before returning back down. If you’re visiting in the winter, be ready for winter sports. TIPS: This is probably not the best activity for individuals who are afraid of heights. Also, be aware that the tram can be cancelled due to rough weather. Are you surprised by some of the things to do in Albuquerque? I was amazed at how diverse the landscape is and really enjoyed getting to explore the area a bit. Hopefully, I’ve given you some ideas for planning your own trip to the area. If you’re looking to explore beyond Albuquerque, definitely head to the White Sands National Monument! Thank you to Visit Albuquerque for hosting me for this press trip. I had no idea they had a super volcano in New Mexico. My son Owen is obsessed with all things volcano related. Maybe we should check into booking a trip! Personally, I would love to see the petroglyphs. Wonderful post! There are so many exciting options when visiting Mexico. I think you brought out some very good points for folks to think about, Riding Hot Air Balloon will be my first choice. Thanks for sharing such a detailed overview. Thanks for the list! I have lived in ABQ for a couple of years now and have never done some of the things on your list! Excited to look into these!! Thank you! I live in ABQ and love it here. Great list, thanks so much!